Reactions to police bodycam footage of Abdi Mohamed, Moab police misconduct, Chaffetz town hall and more. 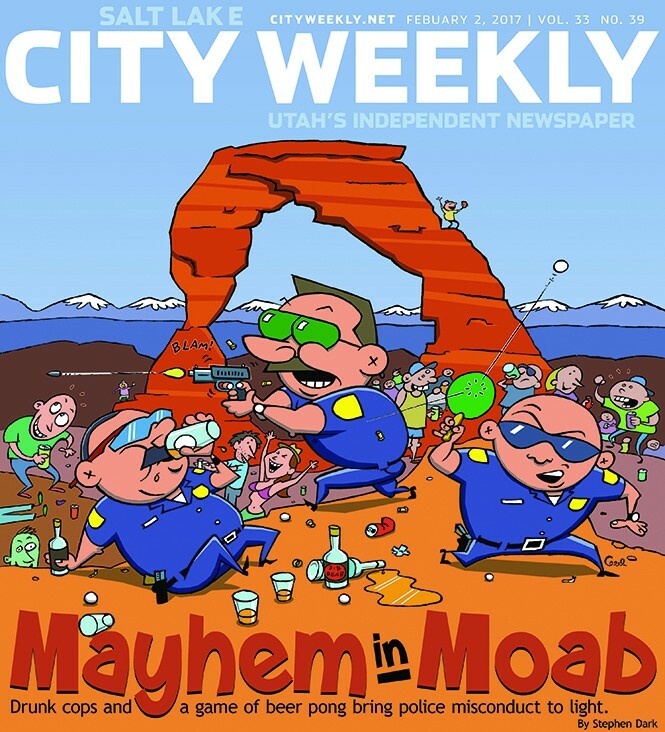 Cover story, Feb. 2, "Mayhem in Moab"
"Soup or Troopers" would have been a better header ... just laying it out there. It's sad that our locals are being depicted as a bunch of drunken white trash hillbillies. Officer Risenhoover is of exemplary character. The allegation of threats to attorney Morgan are purely hearsay with no proof! This is very irresponsible reporting. This story is spot on and the cops involved should be ashamed of themselves. That is why they are not patrolling our streets any longer. Have any of you noticed that a few quit all of a sudden? Maybe these jack holes should have done the same. Instead, they waved it around in the air for the whole town to see. You can't party and be a cop in a small town. Especially with underage teenagers. I've seen the photos of the officers so, yes, it's true, and, if I could, I'd post them here for all to see but I don't feel like getting sued today. Now, if you know me personally, that's a different story. The only thing I ask of you, City Weekly, is that you continue to bring to light the corruption and correlation throughout the entire system. From the police to the city officials, judges, lawyers, DCFS and DA office. They are all in each other's pockets. I do not know all the officers in this article and do not know all the facts of these cases, but I do know Steve Risenhoover and know of his character. For the last 20 years, he has served the people of this community in so many ways, from his volunteering with the fire department to being the first to show up to help a neighbor in need. He has quietly donated time and money for so many people of this community that fell on hard times. The issue of owing taxes to the IRS puts him in a very large group of American citizens, including 50 percent of IRS employees that do not pay their income taxes and a boatload of politicians and millions of other citizens disputing our broken tax system—which are civil matters and not criminal. Anyone questioning Steve's honesty does not know him at all; anyone that has spent any time with him knows that he will always tell the truth, even if to do so hurts him. As to others, not wanting to work with him is a ridiculous statement. Those who have worked with him know that they can depend on Steve to always work harder than anyone else on the job and be there when needed. I know there is so much turmoil in our little town right now and so many angry people and different opinions, but I would hope everyone would look at the good a person does for the community and save their judgments until investigations are complete and stop throwing things out there to tear others apart. News, Feb. 2, "Shots Fired"
So Abdi Mohamed says they could have used other results, instead of shooting a 17-year-old kid with a broomstick ... Or, he could have quit beating the guy, dropped the club and put up his hands. Had he done that, he could have been right back down there the next night [committing more crimes]. Is there a point where this punk takes any responsibility for his own actions? How about trying the Taser next time? News, Feb. 2, "Some Pig"
"This little piggy went to market—the underground black market of livestock doping." Did they get the pig from Lance Armstrong? This is the best thing I've watched since Election Day. The people have spoken! You got the cameras now, Jason! All we need are some pitchforks! This is very entertaining to watch! That's a whole lotta angry white folks. Don't pull a muscle patting yourself on the back, Jason. If spousal abuse had a PR guy, it would resemble this clown. Get ready for the town halls. Remember the Tea Party and what their town halls looked like? No pancake breakfasts for this dink. At least let him talk. He may be a douche, but at least he was willing to show up knowing it was a firing squad he was gonna face. If this was 1776, he would be tarred and feathered by this unruly mob. "Hold on, hold on, hold on ..."
These are the people you represent. Stop telling them to calm down. Obliterate his ego. He works for you. Let your voices be heard. #ThankYouUtah—you're a beautiful state with wonderful people—you can do better than Jason! This "man" doesn't care about you or Utah. He wants to be president. Look it up. The URL for Chaffetz for President is already sold. The high school students in the front row looked bored and could give up their seats for people outside. Thanks for the great reporting of the town hall. Gratified there were so many willing to challenge Chaffetz. It's a shame that the main thing Rep. Chaffetz took away from his most recent town hall meeting was that "paid agitators" were responsible for his frosty reception. If he spent more time with his constituents in the Salt Lake Valley, maybe he would recognize them. The 1,000-plus constituents in the auditorium and the more than 1,500 outside and even more who left because they couldn't get in, certainly didn't appear to me as "paid agitators." His premise that anyone who disagrees with him must be a "paid agitator" and is not one of his constituents, is apparently just an excuse to avoid listening to the very real concerns expressed. Rep. Chaffetz heard concerns his constituents expressed about defunding Planned Parenthood, usurping public lands in Utah, destroying families through forced deportations of mothers, lack of oversight on our current administration, etc. In each case, he listened and then proceeded to lecture his constituents as to why their concerns were incorrect—never providing any real possibility of addressing any of his constituents concerns. His constituents in Salt Lake Valley would like to see Rep. Chaffetz more often. I don't think Rep. Chaffetz gets the same level of reality when information is filtered through his office help. Opinionated readers share their thoughts on clean air, bees and the latest LGBTQ buzz from the church. Readers share their thoughts on beer, the Legislature and the former Moab police chief. Readers share their thoughts on government secrecy, the guv and Prohibition.